It’s estimated around half of us make New Year’s resolutions about improving our health and/or reducing stress, but the majority fall short of meeting our goals. The problem usually lies not in will power, but in goals that are non-specific or too big to tackle at once. Set yourself up for success by picking 1-3 nourishing changes (specific and measurable, so you know when to high-five yourself!) and resolving to do for one month. After a month, add another 1-3, and so on…..
Lifestyle changes need not be complicated, exotic, or expensive. They must be sustainable and affordable. It’s helpful to focus on what we gain through changes, rather than on the idea of denying ourselves. – Breakfast: Eat a real food breakfast. Regardless of your rise-and-shine time, it’s important to break your overnight fast shortly after waking up to regulate blood sugar and nutrient levels, and have the physical and mental energy for the day ahead. Include a quality protein source, along with complex carbs and healthy fats to keep you feeling fueled until your next meal. – Be, Don’t Do: Spend 20 minutes with nature. Breathe outside air, and get a dose of UV rays. Wherever you may roam, there is a park or a green space to be found. Utilize the internet and apps to find a nearby space for a walk, or just a spot to sit. If the only green space available is a patch of grass or tree outside your hotel, go there. Turn off your phone. Trust that nearly everything can wait a mere 20 minutes. Observe nature, knowing you are a part of it, and it is a part of you. Observe your breath and the calming effect this has on your heart rate and mind. – Adaptogen herbs: Add one to your daily regimen to help your body adapt to stress, strengthen and support adrenal function, and support immune system strength. Working with a well-trained herbalist will identify the best fit for your constitution and circumstance. There’s no one size fits all. – Hydrate: Strive to get at least 1/2 your body weight in ounces of H2O. This is a baseline goal for the average person, but since most of our jobs have us sweating it out, your needs are probably greater. The water content in fruits, vegetables, soups, juices, and teas counts. *Jedi Mind Tricks: full pitcher/bottle nearby for a visual aid; if technology is more your style, there are apps and water bottles with alarms to remind you. – Nutrient-rich herbal teas: Brew some! Many of our tried-and-true pIant medicines are both tasty and jam-packed with highly bioavailable vitamins, minerals, and other phytonutrients. I typically will incorporate nutritives such as nettles, oats, and marshmallow root (to name a few) into clients’ custom formulas for nutritional and therapeutic support. (Ask me about tips for making this easy to do on the road). – Food made with your own hands: Replace one processed or restaurant meal with something you make yourself. Easier to do at home than on the road, yes, but not impossible! Start simple, know what is in your food, infuse it with your intention to take care of the most important gear you own…. Your own physical vessel. – Center: Spend 20 minutes doing what centers you. Readers’ choice! Tune in. You know what grounds you. Do the thing. – Move your body: Sitting is the new smoking, and the nature of travel requires we do a LOT of it. Walk, bike, stretch, do yoga, do short video workouts, shoot hoops. Find exercise that’s enjoyable to you, so you’ll be more willing and able to continue doing it. **Bonus points for double-duty choices, i.e, exercising or having a meal outside in the sunlight. Don’t try to build Rome in a day. Succeeding at small, incremental changes can have tremendous impact on our energy and confidence levels, and thereby set the stage for taking on next and bigger steps. Often, we make changes for awhile, then miss a beat. This is NOT “failure”. Look at all the other days you did it! At the end of each day, give yourself credit for what you HAVE achieved, resolve to do the missed thing tomorrow, and keep going! © Darlene Starr is a Practicing Herbalist and Nutritional Therapist, and the owner of Road Dog Health & Wellness, LLC. 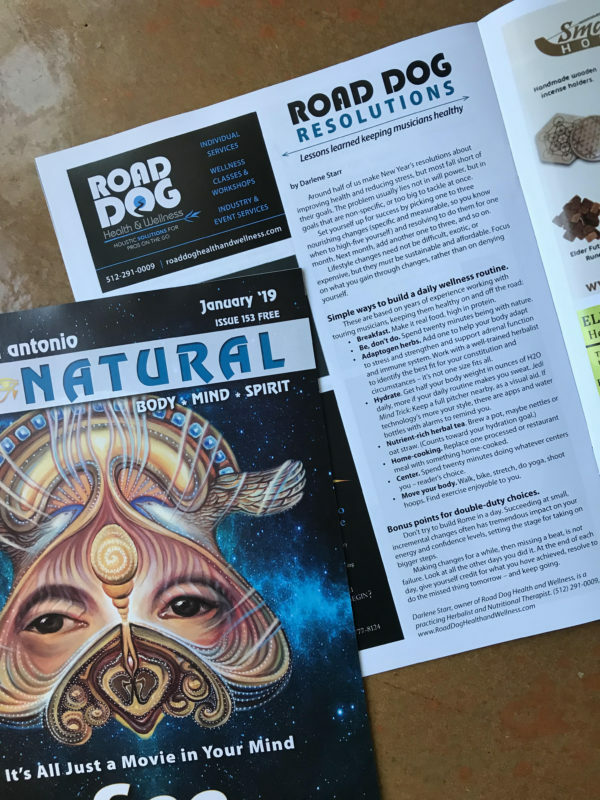 An abridged version of this article originally appeared in All Natural Magazine’s January 2019 issue. This entry was posted in blog, music industry pros, musicians health, pro tips, resolutions, self care, Tips for the Road, Uncategorized and tagged herbal, herbs, music health, musicians health, nutrition, on tour, protips, resolutions, road trip, self care, travel. 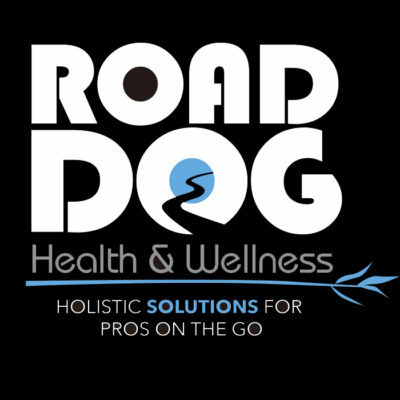 Welcome to Road Dog Health & Wellness, where we specialize in working with professionals on the road.